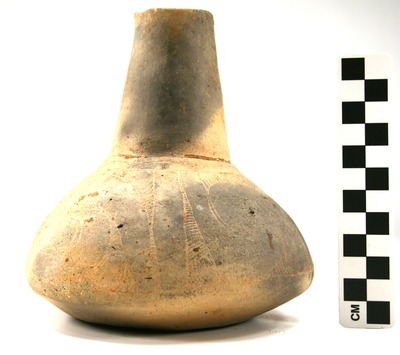 "Vessel 23, Burial 5, 2003.08.1761" by Timothy K. Perttula and Robert Z. Selden Jr.
DECORATION (INCLUDING MOTIF AND ELEMENTS WHEN APPARENT): The vessel body has an engraved design set below three horizontal engraved lines at the top of the vessel body. The motif, hooked arms, is repeated four times around the vessel. Each hooked arm element is filled with hatched lines around a negative oval. Dividers between each of the hooked arm elements are narrow vertical zones also filled with a small negative oval and hatched engraved lines. Taylor Engraved bottle, Vessel 23, Burial 5.